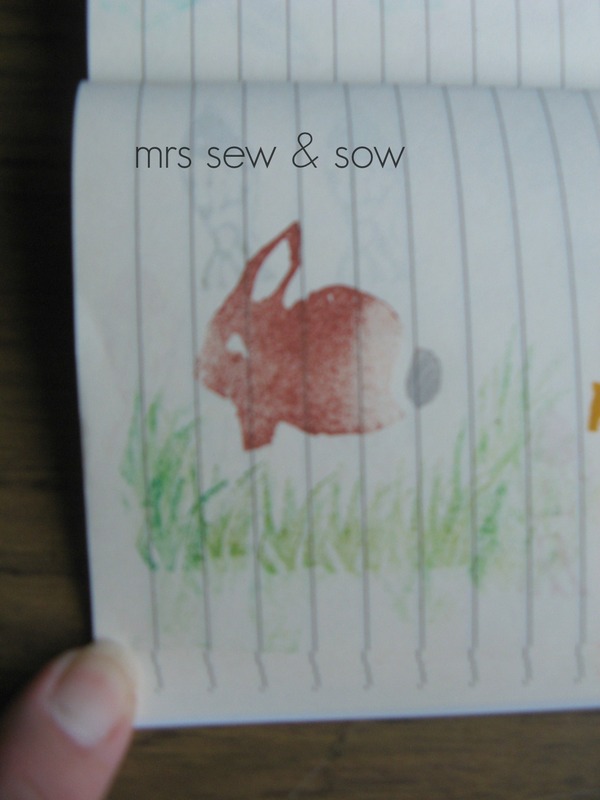 mrs sew & sow: Stamping fun! On Tuesday stuff arrived but not the usual squishy fabric packages! No! 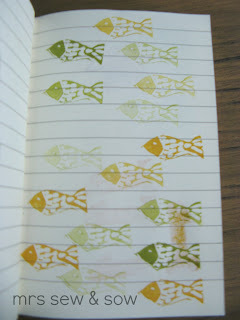 it was fabric ink stamp pads! 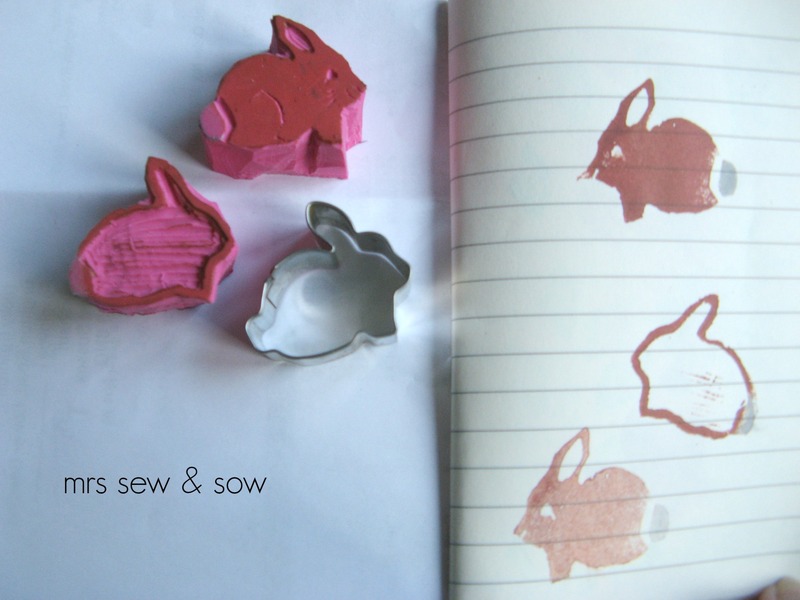 I also had to cut some more stamps so used up the last of my Wilko special large erasers for 79p I think! I cut the outline of some motifs with my trusty scalpel - it gives a nice fine line. Then used my lino cutting tool to chisel out the middle bits though I used my scalpel for my first two stamps and that worked well - it just took a bit longer. Next I tried out all the lovely colours I bought - on paper and on fabric! I used a cookie cutter to make an outline on the eraser for the two rabbit shapes - then cut them out as one positive, one a negative print. You don't need to be able to draw to do this - honest! I do prefer this one! I gave him some grass - though the rabbits in my garden seem to prefer my plants! 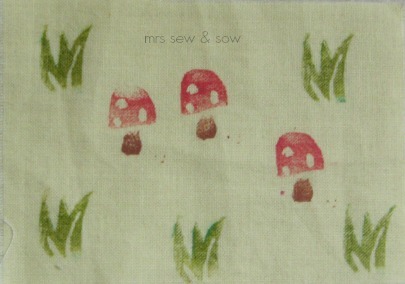 Stamping on fabric brings a different level as if you use a textured or printed fabric that will add to your stamping. I like the texture showing through these birds! It is a bit of a colour sampler for me! 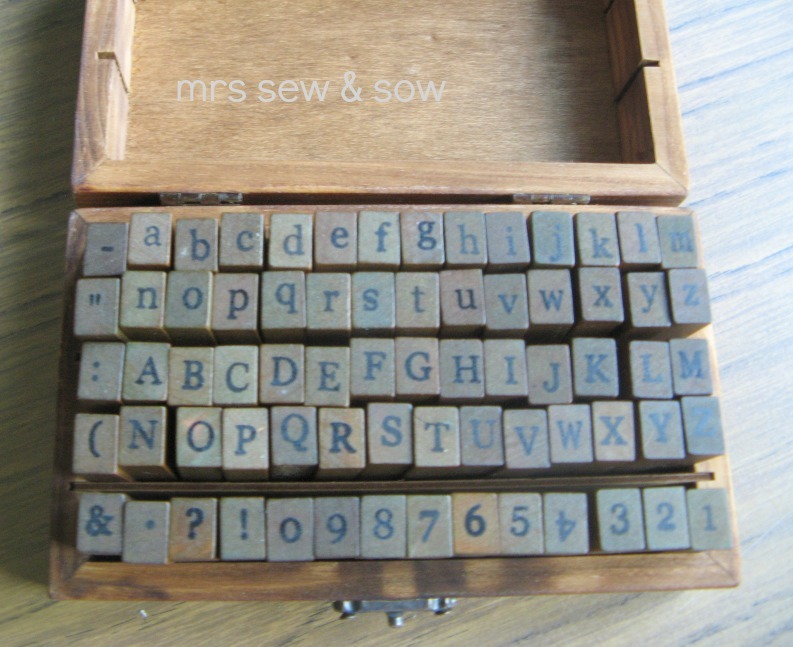 Another purchase was letters and number stamps in a cheap set from Amazon! Probably made somewhere out East as the 4 would print upside down if you looked at the top of the block but they are good enough for my needs I think! Though I have now just seen these ones but caps only! I like the way you can print and space words with it though! 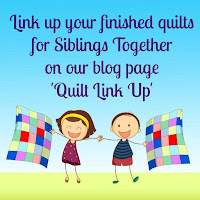 Just think of the cards, labels, ribbon, notelets, wrapping paper you can create! 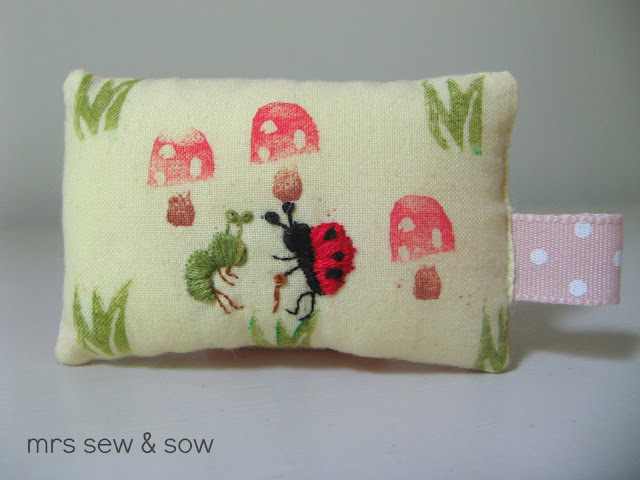 And on fabric the quilt labels, pouches, tote bags, coasters, baskets, mugrugs you can tailor to your tastes! And that is not the end of the lists! 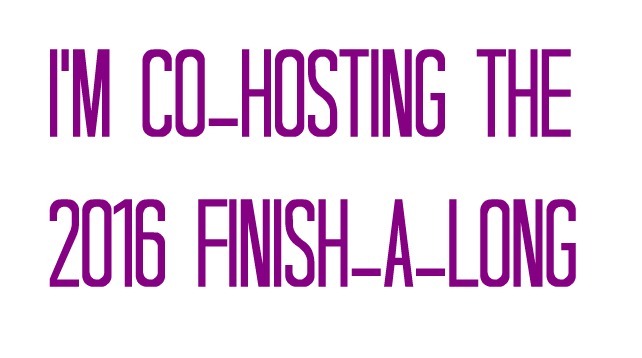 I tried out a blog banner! If you want to know what the pig is about look here! So how much does stamping cost? 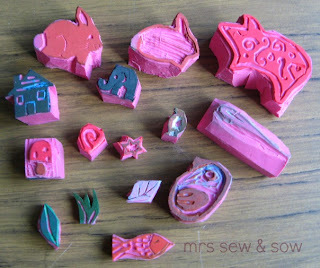 Eraser 79p - it was a big eraser and made several stamps! Linocutter - varies in price from £4.99 - £94!!! Eek and not entirely necessary! Tracing paper and pencil - or grease proofpaper - don't you have that already? Total £6.32 or £11.31 with the lino cutter! Not many hobbies you can start so cheaply! We already have the fabric - right!?? And the main material you use is cheap and readily available as school is starting soon! Or from your chidren's pencil cases! 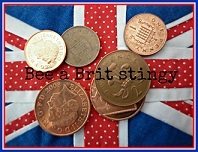 Come on peeps - get stamping! 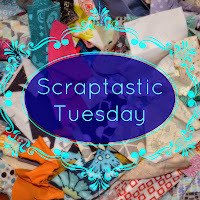 And join the Stamp it up swap! You're on fire. 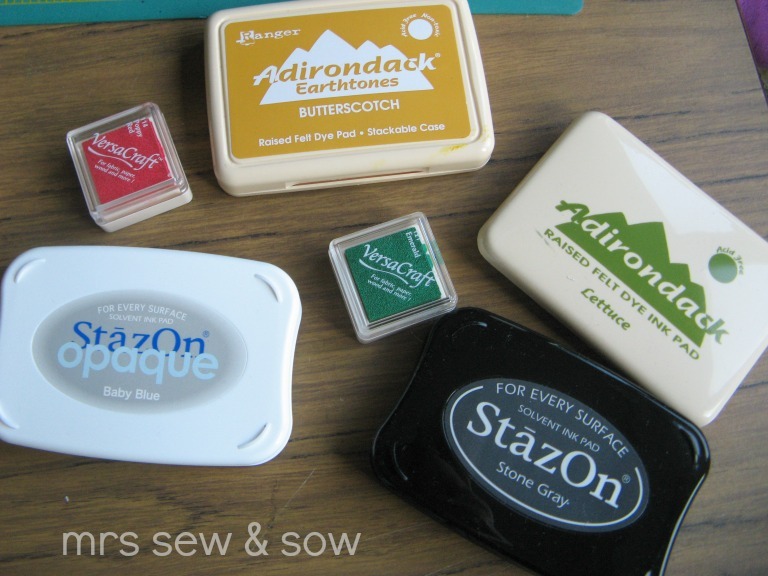 I bought some mini letter stamps in order to do my partners FQR13 badge. I figured I'd get use out of them to do quilt labels too. You are good. I love the little pinnie you made with your sample stamping. These are wonderful. I think you have a new addiction !! I think it might be infectious, I've looked out a lino cutter that's been in the cupboard [not with Sarah;)] for years,but can't seen to find a rubber yet. I'm itching to have a go though. Well look at you! 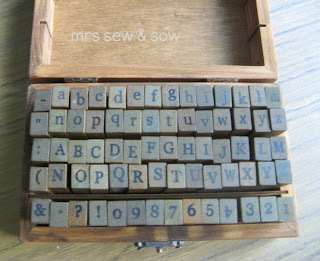 A stamping pro! You're making me think this will actually be OK - I'm a little freaked out, but ready to dive in. Your stamps are just wonderful. 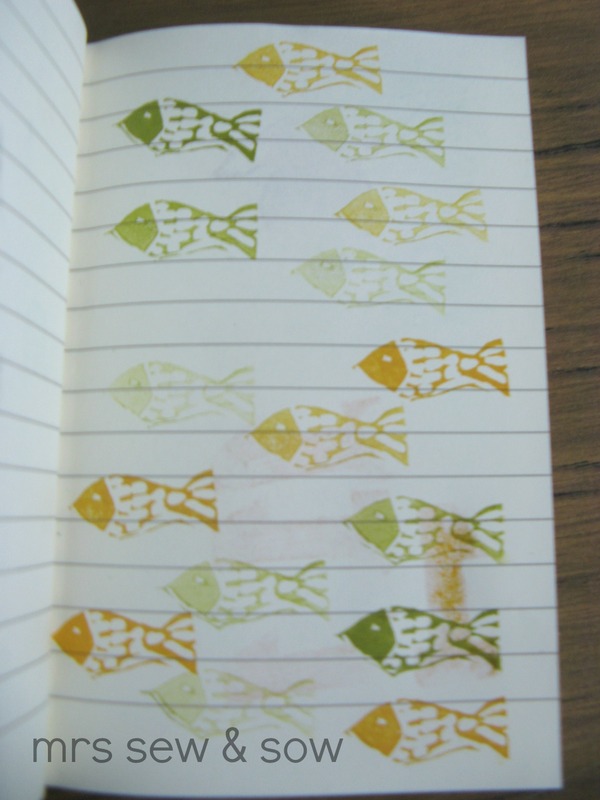 Will you stop being so good at stamping please?! Still not been to Wilkos but it's on my list. Finally did my inspiration mosaic on Flickr so hopefully some inspiration will strike by the time I get my big rubber. And if you buy lino cutters, get a guard too!!! I bought erasers from Amazon before the retreat and they were pretty cheap. Can't wait to start stamping for my (yet unknown) partner!! Sounds like you're having heaps of fun! They're fabulous. these look lovely, id love to join, but i may have to acknowledge then that i have *several* packs of commercial stamps that have never been used!!!!!! These all look fabulous! Love the little elephant stamp!